Former Kilcock Gaa minor football Captain Cormac Daly lines out at second row for the Ireland U20’s in their 6 Nations opener vs France tonight in Bordeaux. Kilcock’s Sheena Bynre is named LGFA overall volunteer of the year. Kilcock’ Sheena Byrne, right of picture before a league game with Maynooth in 2017. Kilcock LGFA secretary and senior footballer Sheena Byrne has been named the LGFA Overall Volunteer of the year for 2017. The Overall Volunteer of the Year, Sheena will receive the Lulu Carroll award, named after the late Lulu Carroll, who was a 2001 All-Ireland senior medallist with Laois. Sheena is club secretar, coordinating and fundraising activities for Kilcock’s adult and juvenile sections, and remains an active playing member. In 2004, Sheena, who is a local school teacher in Scoil Choca Naofa, was responsible for setting up the club’s juvenile section along with her sister Linda and she is renowned for her outstanding communication and organisational skills throughout the club and the county of Kildare. LGFA President Marie Hickey commented: “We are really excited by the establishment of the new LGFA Volunteer awards and delighted to honour our very first winners. “It is important to recognise our volunteers, who undertake sterling work in their local communities on behalf of our Association. “We received a large volume of nominations and whittling them down to settle on winners was an onerous task. “I would like to thank everybody who submitted nominations and we congratulate the winners. Posted on February 1, 2018 February 1, 2018 Categories Gaa, LGFA, Lifestyle, UncategorizedTags extra time, extra time sport, Extra Time Sport Live, extratimesport, ExtraTimeSportLive.com, Kilcock, Kilcock Ladies, Kilcock LGFA, Kildare, Kildare LGFA, LGFA, Meath, Meath LGFA, sheena byrne, sheena byrne kilcockLeave a comment on Kilcock’s Sheena Bynre is named LGFA overall volunteer of the year. Jockey Robbie ‘Puppy’ Power was last night named Meath’s Sportsperson of the year for 2017 at an awards ceremony at Knightsbrook Hotel in Trim. The Moynalvey man enjoyed great success during 2017 alongside the Jesssica Harrington trained Sizing John, capturing a triple crown of Gold Cups at Leopardstown, Cheltenham and Punchestown. There was double reason to celebrate in the Power household as Robbie’s father Cpt.Con Power received the Hall of Fame award on the night. 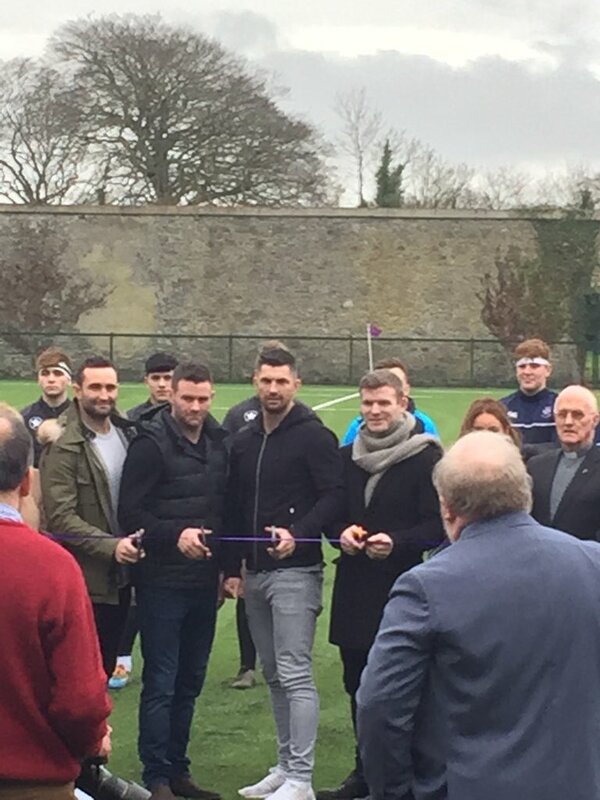 Current Leinster and Ireland stars Dave and Rob Kearney, Fergus McFadden and former player Gordon Dacy were all at Clongowes College in County Kildare yesterday, Saturday January 13th to cut the ribbon on the school’s new PST Sport state of the art 3G pitch.